When he heard about the disaster that nearly befell the Buffalo Sabres at practice Monday in HarborCenter, former Sabres enforcer and current television host Andrew Peters was quick to point out on Twitter that it was National Bubble Wrap Day. How appropriate. The Sabres probably could have used some bubbles to protect their ultra-fragile cargo as All-Stars Jeff Skinner and Jack Eichel returned to practice after their weekend in San Jose – and then were both lucky to emerge unhurt after an ugly-looking collision with each other during a drill. The team had just switched from the smaller of HarborCenter's two rinks to a fresh sheet of ice on the feature rink when Skinner lost his balance and skidded at full speed into Eichel, hitting his center just below the knees as Eichel lunged forward to avoid him. Skinner quickly hopped to his feet and Eichel, who initially looked a little shaken up by the collision, slowly skated over to the boards to collect himself and then rejoined drills a couple minutes later. "I didn't want to hurt Jack. I knew I was all right," Skinner said. "It wasn't a good feeling. You're falling on your pants there and you don't have much control of where you're going or how to stop. But he's got pretty good reflexes and got out of the way pretty quick, so he was all right." 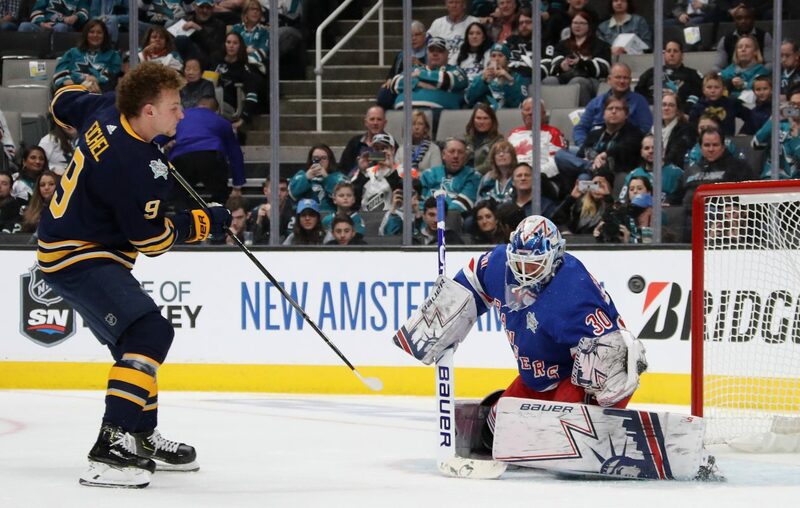 The incident was reminiscent of a 2012 practice collision in KeyBank Center when Sabres defenseman Jordan Leopold skidded on the ice and took out coach Lindy Ruff from behind. Ruff crashed to the ice on his back and suffered three broken ribs, forcing him to watch the next few games from the press box rather than the bench. Ruff had no idea Leopold was sliding toward him. The difference here was that Skinner was coming from the front, so Eichel saw the oncoming collision. "It's good that we're able to laugh about it," said a chuckling Eichel. "I think he lost an edge there. That could have been pretty bad, so it was good it wasn't." Eichel, of course, has dealt with high ankle sprains each of the last two seasons and just came back from a three-game absence due to an upper-body injury. Skinner has played all 48 games for the Sabres this season and has only missed three games over the last four seasons. Both players will be fine for Tuesday's game in Columbus. The Sabres return to play after the break four points out of the last playoff spot in the Eastern conference and are just 3-6-1 in their last 10 games. After playing the Blue Jackets, they are in Dallas Wednesday before opening a seven-game homestand Friday against Chicago. "Early in the year, there were shifts we weren't getting too much offensively but we weren't giving up as much," Eichel said. "It's important to get back to where we're hard to play against in our own zone and hard to play against when we have the puck."